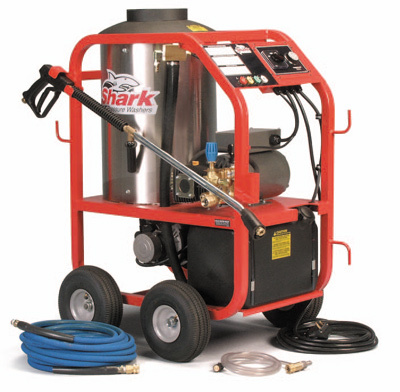 1,000 PSI Hot Pressure Washer Details - Quasius Equipment, Inc.
Our Shark Hot Pressure Washers put out 1,000 PSI pressure. They utilize an electric motor to run the pump and an oil-fired burner to heat the water. These units are commonly referred to as "steam cleaners," but that's technically incorrect because steam cleaners heat water to around 235 degrees but only put out around 135 PSI of pressure. The hot pressure washers are what are used in automotive and industrial situations where water is heated to 200 degrees but still retains the higher pressure of water versus the lower pressure of steam to do a good job of cleaning. These units are great for removing built-up grease and grime from industrial machinery, farm implements, construction equipment, or vehicles. All you need to supply is a 120-volt circuit and a garden hose feed. These units do require every bit of a 20amp circuit so you won't be able to run these if you have a 15 amp breaker or if you have other things running on the same 20 amp breaker as the pressure washer. It needs a full 20 amps and doesn't share very well. Water requirements are easy. The washer requires around 3 GPM, which is easily handled by almost any water spigot and is supplied through regular garden hose. A 50' high pressure hose is included with a trigger control gun and spray wand at the end. The burner runs on kerosene or diesel fuel and an optional chemical injector kit adapts the washer to inject soap or other chemicals into the wand to aid in cleaning. We do have a selection of heavy duty cleaning soaps and degreasers available for sale at our location should you require them. These units are large and weigh 480 lbs. so they can't be lifted. They can be loaded into pickup trucks and vans via our loading ramp or we do have a small utility trailer with a fold down ramp-gate that is available if you need it. These units also must be transported in 35 degree or warmer weather or else they will freeze up and crack the coil and pump units. During winter these units must be transported in a heated van and kept inside a heated building during use and storage. If you plan on transporting them in a pickup truck with a cap, do take note that these units are 44" tall. Rates don't include charges for kerosene. The unit will be full when it leaves and we'll top it off upon return and charge for the actual fuel used.